Being out of the country and trying to figure out how to pay for things can be difficult at times. Do I want to pay the transaction fees that the credit card companies charge? Is it safe to carry large amounts of cash? How much will my bank charge if I use a debit card? Well in Korea, credit cards are widely used (Visa, American Express, etc). Luckily we have the Chase Sapphire Preferred card which allows us to use our credit card anywhere in the world with no foreign transaction fees. It has been invaluable since we got it. However, I recently signed up for a class that asked us to pay via wire transfer to their bank account. These are the times we wish we had a Korean bank account. So I just picked up our alien resident card from Seoul immigration last week (yes I’ve been slacking) and decided to go open an account. 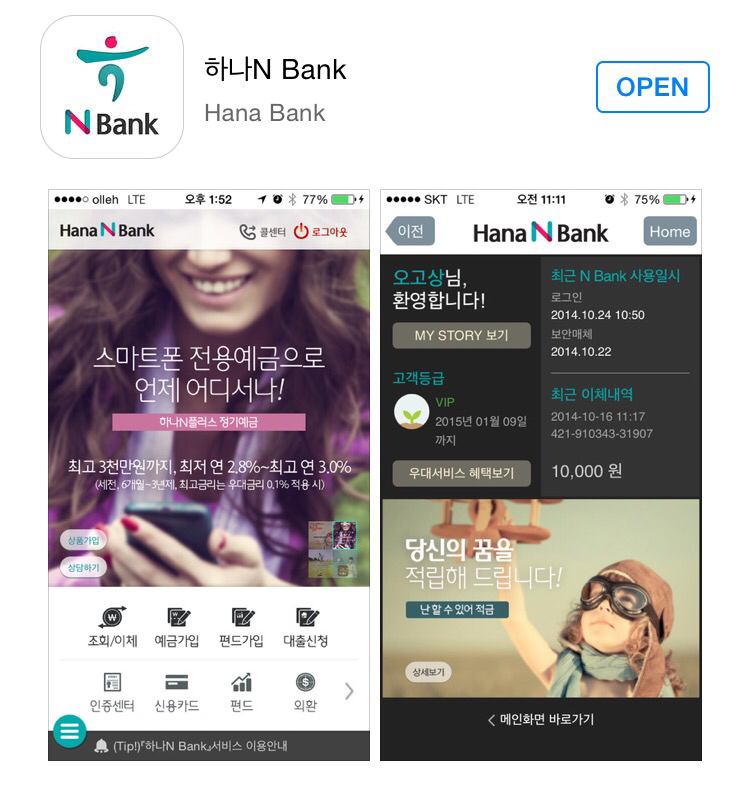 I did some research online and saw some good comments about Hana Bank and then I checked to see where the closest one was to us and to my surprise, we have one literally down the street! I went in, took a number and waited to be called. When I was called, I went up to the counter and asked if anyone spoke English. To my dismay, the bank clerk was not able to communicate with me at all, she just held up a finger indicating for me to wait. A few moments later she said 10 minutes, so I took a seat and waited. A new clerk arrived in about 10 minutes and she asked in English if she could help me. I informed her that I wanted to open a new account. After a while, she had me enter a PIN number for wire transfers and the ATM and then also helped me download the Hana Mobile banking app. 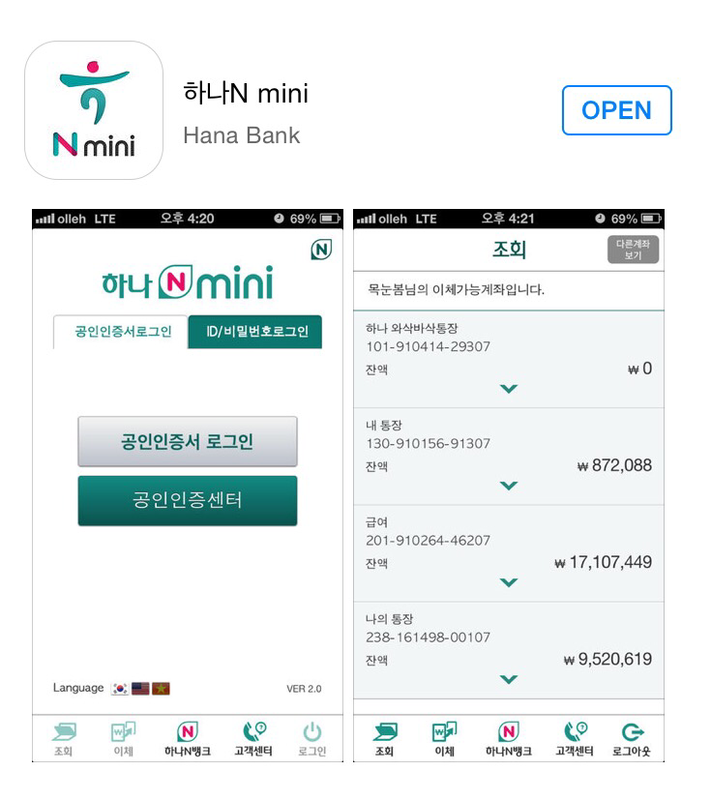 We went through a bunch of steps to setup my account password and then we downloaded the Hana N Mini app that actually has an English version. Now I can make wire transfers via the app and check my account balance and transactions. Be aware that there are no fees to open the account or monthly maintenance fees. You do however have to pay for the services you use. For example, you pay for atm withdrawals after business hours, (the amount of the withdrawal will determine the fee) fees start at 300 won. You also get charged to use your debit card, but depending on how much you charge on the debit card you could get some portion of your fees refunded. One final thing, the exchange rate at the bank is pretty good! At a currency exchange they were quoting 1120 won for $1, Hana bank quoted me 1169 for $1 today. While it isn’t a requirement to get a bank account if you live here, it definitely makes things a little easier. 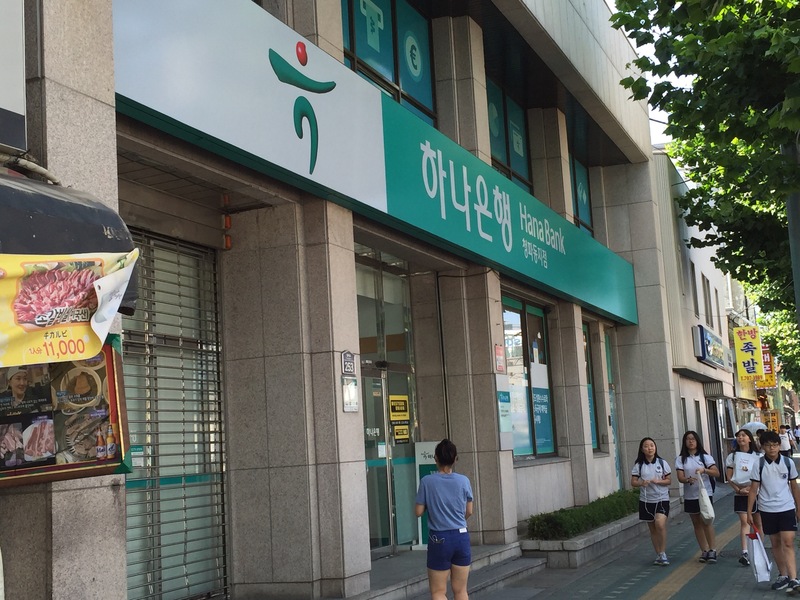 Overall I am very excited to be setup with a Korean bank account and it has been pretty easy to use so far and the bank clerk who helped me was super friendly. I was already able to send out a quick wire transfer today! We are looking forward to the convenience having an account will offer. Previous Post Budae Jjigae What! ?